Below are some of the most common questions we get and the answers we hope are helpful. Am I an Orange County Utilities customer? Orange County Utilities serves water customers in unincorporated Orange County, Florida. Please visit the Orange County Property Appraiser or call 407-254-9837 to determine if you are in our service area. I live in Orange County. Does that mean I can participate in Orange County Utilities' programs? Only water customers served by Orange County Utilities can participate in these programs. If you are served by another water provider, please call the number on your bill to inquire about the programs they offer. What should I do if I have a leaking pipe? If you have a leaking pipe, turn off your water and call a licensed plumber. What if I don’t know how to turn off the water to my home? If you don't know how to turn off your water, call the number for Water Emergencies at 407-836-2777. Am I responsible for a leak in my home? Yes. You are responsible for the water system past the water meter toward your home. My irrigation system keeps running even though it’s shut off at the timer box. What can I do? If you have a backflow preventer, you should shut the system off at the backflow preventer (often located at the side of your home) and call a licensed irrigation contractor. How can I save water at home? Please enroll in the Water Wise Neighbor Program or check out What You Can Do to find the best ways to save water at home. Please check out the Get Your Watering Days link for details. I received a watering violation. What should I do? Please contact our Water Watch office at 407-254-9845. Do I need to buy bottled water to prepare for a hurricane? No. You can simply fill food grade containers that you already own with water directly from your tap. It is safe, economical, and eliminates the need to stand in long lines at the store for bottled water. Learn about what we are doing to help our customers become more water conscious and things you can do to reduce your water use. 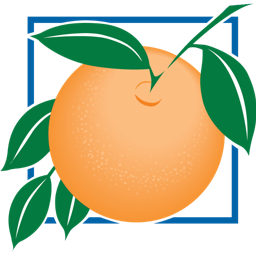 Copyright © Orange County Government, Florida. All Rights Reserved. Daylight Saving Time is the second Sunday in March until the first Sunday in November. 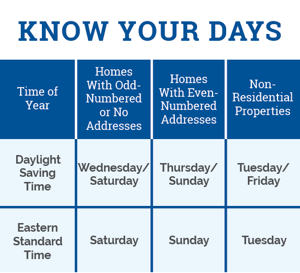 Eastern Saving Time is the first Sunday in November until the second Sunday in March.